U.S. regional tribal casino operator Mohegan Tribal Gaming Authority, also known as Mohegan Sun, expects to receive around US$750 million in fee income from its involvement in a new casino resort at Incheon, near South Korea’s capital Seoul. Mohegan Sun is one of the investors in the project (pictured in an artist’s rendering). The other consortium partner is South Korean chemicals manufacturer KCC Corp. The Incheon International Airport Corp, the operator of the air hub next door to the project, is also involved in the scheme. According to slides of a Mohegan Sun presentation at the Bank of America Merrill Lynch 2016 Leveraged Finance Conference – which took place in Florida, in the United States, on Tuesday – the firm “will invest US$100 million (already raised) for 50-percent plus of the project’s equity, earn a development fee during construction (around US$45 million) and a 24-year management fee (3 percent of all revenues [plus] around US$30 million per year)”. Mohegan Sun however cautioned that the definitive management and development agreements for the property had not yet been signed. The presentation slides did not provide details about financing for the construction of the casino resort. The firm said the project had “the potential to be transformational” for Mohegan Sun. In Macau, the local government has stated that non-gaming revenue should account on average for at least 9 percent of all revenue generated by casino operators by 2020. The Macau government estimates such non-gaming revenue was 6.6 percent in 2014. Mohegan Sun said it expected gaming patrons at its South Korean casino to be “primarily from [the] premium mass segment, helped by airport proximity”. The firm forecast only around 20 percent of the revenue would come from VIP players. 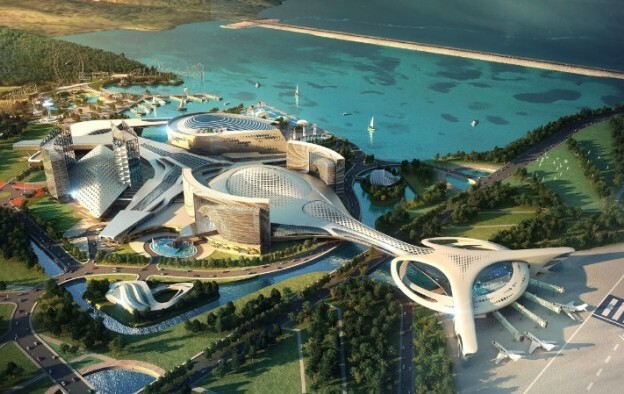 The first phase of the scheme – which is dubbed “Inspire Integrated Resort” – has an estimated budget of US$1.6 billion, with a total commitment of US$5 billion for multiple phases over a period of 20 years, according to Mohegan Sun. The project – Mohegan Sun’s first venture outside North America – would include a foreigner-only casino; three hotel towers with a total of 1,350 rooms; a 15,000-seat arena; a theme park; convention space; and shops and restaurants. Also at Incheon, South Korean casino operator Paradise Co Ltd and Japanese pachinko operator Sega Sammy Holdings Inc are developing a new casino scheme called Paradise City. The first phase of Paradise City – a resort also featuring a foreigner-only casino – is scheduled to open in April 2017. A third foreigner-only casino project announced for Incheon involves Hong Kong-listed real estate developer Lippo Ltd and U.S.-based casino group Caesars Entertainment Corp. Construction for the unnamed casino project has not yet started, according to several investment analysts covering the gaming sector. Lippo has announced it intends to dispose of its stake in the scheme. South Korea currently has 17 casinos, but the country’s nationals are only allowed to gamble at one of them – Kangwon Land in an upland area of Kangwon province.